Athena was born at Virginia Zoo on March 5. 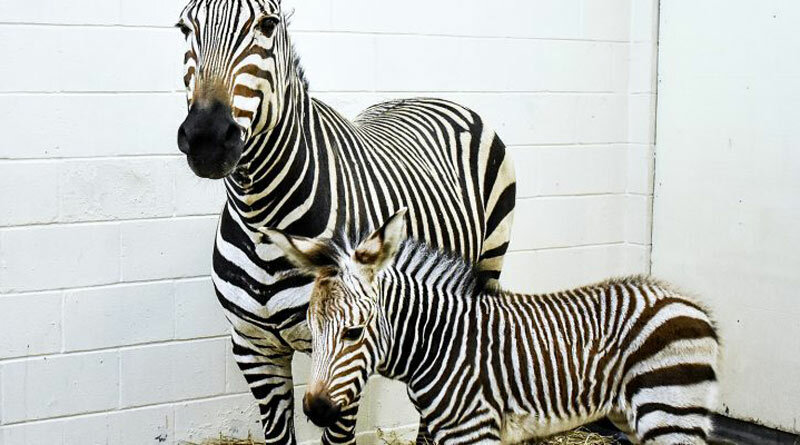 A fourth filly foal has been born to Hartmann’s mountain zebra Abby at Virginia Zoo in the US, adding valuable genetics to the threatened species. Abby, 16, gave birth to Athena on Monday, March 5. She is Abby’s fourth filly foal and the third for her father, Zack, who is seven. Zookeepers chose the name Athena based on the tradition of choosing a name with the first initial “A” after mom, Abby. Abby and her new foal Athena. “The foal weighed 80 and stands approximately three feet tall,” said Zoo Veterinarian Dr Colleen Clabbers. The Zoo has four zebras, Abby, Zack, 13-year-old Rose and now Athena. Both mom and foal are behind the scenes during the cooler weather, but should be gradually introduced to the exhibit in the coming weeks. Female zebras produce a single foal every one to three years, after a gestation of about one year. The foal will stay close to her mother for eight to 12 months before being weaned. This is a significant birth for the species as Hartmann’s mountain zebras are threatened in the wild and there are less than 60 individuals in the North American zoos as part of the Association of Zoo and Aquarium’s Species Survival Plan (SSP). Hartmann’s mountain zebra (Equus zebra hartmannae) are a subspecies of the Mountain Zebra (Equus zebra), and range from 10 to 14 hands in height. They are unusual in that they are the only equine with a dewlap. They are native to Namibia and most commonly found in the extremely harsh environmental conditions of the Kunene Region in the North West. Numbers are expected to decline, largely driven by an increase in hunting and loss of natural habitat to agriculture. Most groups live outside national parks on private land and ranches. Athena is the fourth filly born to Abby.